I've been posting this -- or posts very much like it -- for over a decade. And I'm gonna keep doing it until everyone gets it right. Because it's important. What's the problem? Some people call today "Presidents' Day." Those people are wrong. Don't be those people. Today isn't Presidents Day. It's Washington's Birthday. At least, that's the holiday. 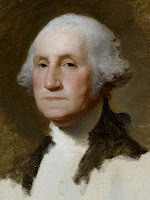 His real birthday is actually coming up on the 22nd, but today is the federal holiday honoring Washington's Birthday. Check out 5 U.S. Code § 6103.